I recently spent a couple of weeks on Jury Duty at the King County Courthouse which brought me to downtown Seattle every day for the duration. There was a decent amount of downtime and a long lunch so I spent a lot of time walking around the city. 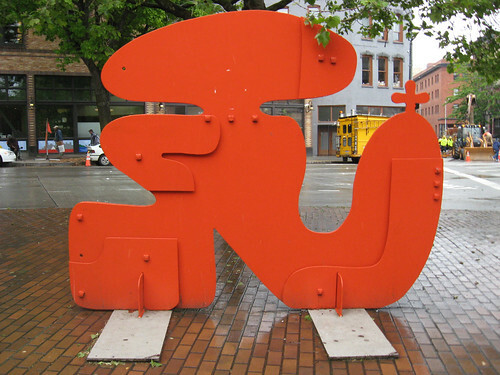 Seattle is known for its public art (though the program has not near been as well funded nor as risk taking as it used to be) and there is lots to find in and around the city. My primary digital camera that I’ve been using for the last number of years had broken and I wasn’t quite prepared to replace it just yet. However I like keep a small point and shoot camera on my bicycle and I’d been shopping eBay looking for a good deal on one of those. I found one and so for the last couple of days of Jury Duty brought the camera. Stumbling across Isamu Noguchi’s Landscape in Time in front of the Federal Building was the imputus to bring in the camera instead of just using my cameraphone. 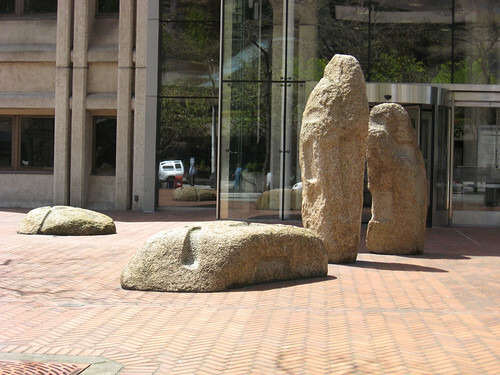 A collection of carved (and cast perhaps) rocks strewn across the brick courtyard of the federal building, it is a difficult piece to photograph. After I took a picture of the plague with the piece information on a suit who’d just exited the building stopped and read the plaque – perhaps a long time employee who’d stopped seeing this art. 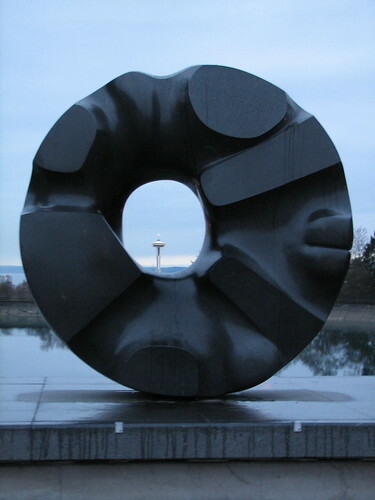 This is one of several great Noguchi sculptures in the PNW the most famous of course being Black Sun (pictured at right) but my favorite is his Skyviewing Sculpture at Western Washington University. There are also a number of pieces that I stumbled across that had no identifying plaque and seemed more temporary. The above piece is an example of this, for even though it seems to have been there a while it doesn’t seem embedded in the ground and there was no information about it. Other works, like the one at the top of this page, weren’t created as “public art” but is an old piece of commercial art that time and circumstance has transformed into art. Anyway there is tons of public art all over Seattle and I have many more photos to upload. 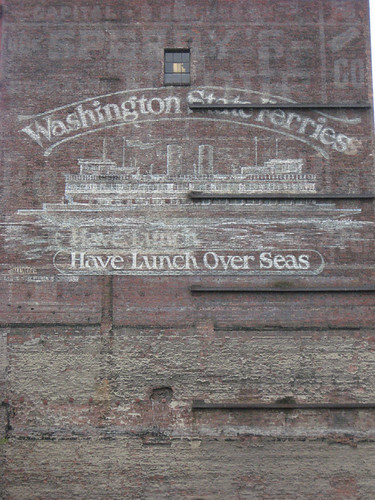 So take a look at my Seattle Public Art Set on Flickr and watch for updates. A Spiral Cage is powered by	WordPress 4.6.14 and delivered to you in 0.350 seconds using 24 queries.